Plastic parts and storage trays can be used for many uses in a variety of combinations. 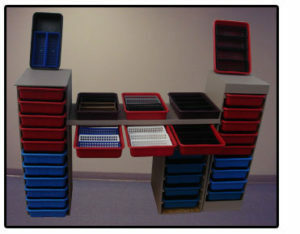 Trays can be used on wire racks, wood shelves, or custom case goods, both open and enclosed. Baskets can be added to trays to create four sections within the trays. Trays and baskets are available in various colors to help identity contents. Parts trays and baskets are manufactured by injection molding with many grades of polypropylene or polyethylene using virgin or recycled plastic. Polypropylene trays are tough, durable and chemically resistant. Polyethylene trays are not only tough, durable and chemically resistant, but also more flexible and softer feeling. or when empty, nested together.